Rothschild's giraffe (Giraffa camelopardalis rothschildi) is a subspecies of the giraffe. It is one of the most endangered distinct populations of giraffe, with 1669 individuals estimated in the wild in 2016. The IUCN currently recognizes only one species of giraffe with nine subspecies. Giraffa camelopardalis rothschildi was named after the Tring Museum's founder, Walter Rothschild, and is also known as the Baringo giraffe, after the Lake Baringo area of Kenya, or as the Ugandan giraffe. All of those living in the wild are in protected areas in Kenya and Uganda. In 2007, Rothschild's giraffe was proposed as a separate species from other giraffe. 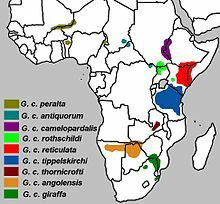 In 2016, Rothschild's giraffe was proposed to be conspecific with the Nubian giraffe, but that taxonomy has not been widely adopted. The Rothschild's giraffe is easily distinguishable from other subspecies. The most obvious sign is in the coloring of the coat, or pelt. Whereas the reticulated giraffe has very clearly defined dark patches with bright-whitish channels between them, Rothschild's giraffe more closely resembles the Masai giraffe. However, when compared to the Masai giraffe, the Rothschild's ecotype is paler, the orange-brown patches are less jagged and sharp in shape, and the connective channel is of a creamier hue compared to that seen on the reticulated giraffe. In addition, Rothschild's giraffe displays no markings on the lower leg, giving it the impression of wearing white stockings. Another distinguishing feature of Rothschild's giraffe, although harder to spot, is the number of ossicones on the head. This is the only Giraffa phenotype to be born with five ossicones. Two of these are the larger and more obvious ones at the top of the head, which are common to all giraffes. The third ossicone can often be seen in the center of the giraffe's forehead, and the other two are behind each ear. They are also taller than many other populations, measuring up to 5.88 metres (19.3 feet) tall. Males are larger than females and their two largest ossicones are usually bald from sparring. They usually tend to be darker in colour than the females, although this is not a guaranteed sexing indicator. Isolated populations of Rothschild's giraffes live in savannahs, grasslands and open woodlands of Uganda and Kenya. They are possibly regionally extinct from South Sudan and northeastern Democratic Republic of the Congo. Rothschild's giraffe at Paignton Zoo, England. Rothschild's giraffes mate at any time of the year and have a gestation period of 14 to 16 months, typically giving birth to a single calf. They live in small herds, with males and females (and their calves) living separately, only mixing for mating. Giraffes in general are classified as vulnerable. Very few locations are left where Rothschild's giraffe can be seen in the wild, with notable spots being Lake Nakuru National Park in Kenya and Murchison Falls National Park in northern Uganda. Various captive breeding programmes are in place — notably at the Giraffe Centre in Nairobi, Kenya — which aim to expand the gene pool in the wild population of Rothschild's giraffe. As of January 2011[update], more than 450 are kept in ISIS (international species information system) registered zoos (which does not include the Nairobi Giraffe Centre), making both it and the reticulated giraffe the most commonly kept phenotypes of Giraffa. ^ a b Reed, Christopher (11 October 2005). "Obituary - Betty Leslie-Melville". The Guardian. London. Retrieved 19 April 2007. ^ Odada, Eric O. "Lake Baringo" (PDF). Archived from the original (PDF) on 5 June 2011. Retrieved 7 March 2010. ^ Brown, David M.; Brenneman, Rick A.; Koepfli, Klaus-Peter; Pollinger, John P.; Milá, Borja; Georgiadis, Nicholas J.; Louis, Edward E.; Grether, Gregory F.; Jacobs, David K. (1 January 2007). "Extensive population genetic structure in the giraffe". BMC Biology. 5: 57. doi:10.1186/1741-7007-5-57. ISSN 1741-7007. PMC 2254591. PMID 18154651. ^ Bercovitch, Fred B.; Berry, Philip S.M. ; Dagg, Anne; Deacon, Francois; Doherty, John B.; Lee, Derek E.; Mineur, Frédéric; Muller, Zoe; Ogden, Rob (20 February 2017). "How many species of giraffe are there?". Current Biology. 27 (4): R136–R137. doi:10.1016/j.cub.2016.12.039. ISSN 0960-9822. PMID 28222287. ^ Nowak, R. M. (1999). Walker's Mammals of the World. Volume 1. Baltimore, USA and London, UK: The Johns Hopkins University Press. pp. 1086–1089. ^ "Lake Nakuru National Park". UNESCO. Retrieved 7 March 2010. ^ "National Parks & Safaris". Uganda Tourist Board. Archived from the original on 10 February 2007. Retrieved 9 May 2007. ^ International Species Information System (2011). Giraffa camelopardalis. Version 12 January 2011. This page was last edited on 29 March 2019, at 15:10 (UTC).